Enter To Win A Bridal Party Book Club Kit! Are you ready for wedding season? Whether you’re planning your own big day, part of the wedding team for a friend, or just feeling love in the air, we’ve got everything you need to plan the perfect bridal party-themed book club with your besties! 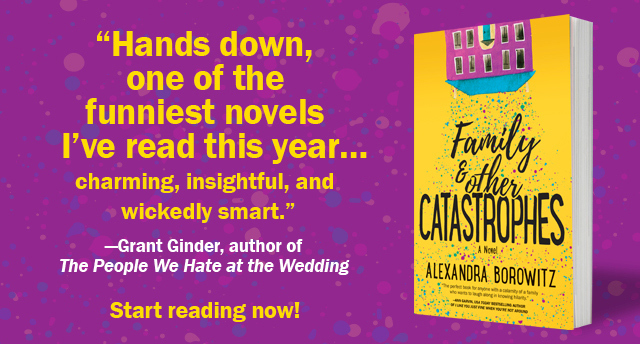 Be among the first readers to enjoy a hilarious new novel with five advanced copies of Family and Other Catastrophes by Alexandra Borowitz, then meet up to discuss the book over champagne and snacks on us, plus other bridal party goodies! A book club is the perfect opportunity to step away from whatever is stressing you out and bond over wedding season with your best friends – so what are you waiting for? Enter now! NO PURCHASE NECESSARY TO ENTER. Purchase or acceptance of a product offer does not improve your chances of winning. Sweepstakes opens 03/21/2018at– 12:01 PM EST and closes 03/28/2018 at 11:59 PM EST. Enter online at https://www.bookclubbish.com/?p=9041. Open to legal residents of the U.S. and Canada (excluding Quebec) above the age of majority. Void where prohibited by law. Void in Quebec. One prize will be awarded with ARV: $250 USD. Odds of winning depend on the number of eligible entries received. Official Rules available online at https://www.bookclubbish.com/bridal-party-book-club-sweepstakes/. Sponsor: Harlequin Enterprises Limited. Q&A with Steven Hartov On The Soul of a Thief + Giveaway! Thank you for allowing me to enter the contest to win the “Family and Other Catastrophes” book.